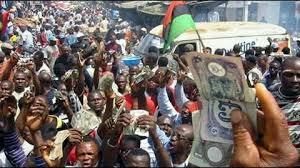 BIAFRA: IPOB NOT UNLAWFUL: WILL NIGERIAN ARMY AND POLICE OBEY COURT RULING? Justice Binta Nyako of the Abuja High Court, after much hassle and irrefutable argument of the defense counsel of Nnamdi Kanu, Barr. Ifeanyi Ejiofor to quash all charges against his client, had on first March, 2017 declared the Indigenous People of Biafra( IPOB) a lawful society, against the view of the federal government of Nigeria under dictator Muhammadu Buhari. Prior to this judgement by Justice Nyako, Nigerian security agencies have been dealing with family members of the Indigenous People of Biafra, like criminals; incessant arrests, unlawful detention and brutal killings even without any provocation. There are cases where IPOB were shot dead during their prayer gathering and family meetings. The Indigenous People of Biafra are being hunted and arrested, detained and killed during peaceful protests, rallies, evangelisms, and even when they pay solidarity visits to their leader in Kuje prison and also molested at court premises. Nigerian security forces are also fond of arresting IPOB members seen adorning themselves with different Biafran wears, emblems or items in their possession, such as Biafran T-shirts, caps, stickers, bangles, shoes, badges, mufflers, etc. They also harass and arrest newspaper vendors who sell papers containing Biafra news and even go further to confiscate their newspapers and destroy their news stand which is an avenue for their survival. Now that a Court of competent jurisdiction has made it clear that IPOB is a lawful society, Nigerian army, police, Navy, DSS and other Nigerian security agencies should henceforth, steer clear from the activities of IPOB. The IPOB have the right of gathering without the interference of Nigerian security agencies, they have right to peacefully protest and rally without being shot dead, they have the right to express themselves in any way they feel including wearing Biafra T-shirt, cap, shoes, etc, without being arrested or prosecuted. It is said that Nigerian security agents do not obey laws; it is time to put them to test, to know whether it is true or not. By the ruling of the Court on March 1, 2017, the unlawful arrest, detention and killings, including forceful disappearance should be stopped. The Indigenous People of Biafra have at all times conducted themselves in the most civilized manner while pursuing the total restoration of the nation of Biafra even at the highest level of provocation. Nigerian security operatives should be civilized enough to understand that IPOB are peace-loving people and must begin to treat them as such.